In OT school, you likely learned about physical trauma, from polytraumas sustained from an explosion on the battlefield, or the physical forces behind a traumatic brain injury. However, there are other kinds of trauma, resulting from different types of events than physical traumas. 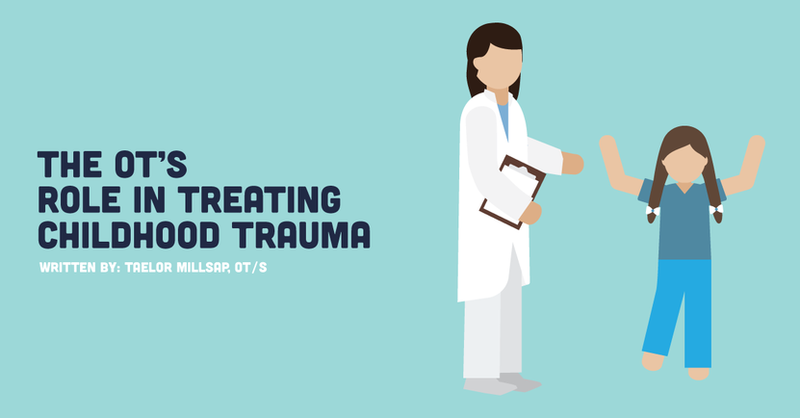 Psychological trauma can have long-lasting harmful effects just like physical trauma, and treating childhood trauma, as a particular form of psychological trauma, requires a specific plan. To understand what I mean, let’s think of the meaning of “traumatized.” It’s a fairly common word that is often used after a tragedy. A person is described as traumatized when they are very afraid or maybe not acting like themselves after a horrible experience. Some of these traumatic experiences include what you hear regularly in the news, like abuse (physical, sexual, & emotional), neglect, and witnessing violence. Others we may not think of as quickly, such as natural disasters, living with a parent with mental illness or substance abuse, and loss of a loved one. Childhood trauma results from a firsthand or secondhand experience of an event, such as those listed above, that is particularly distressing and the child doesn’t have the ability to cope. That’s childhood trauma in a nutshell. What is the ACEs study? At this point, you might be thinking about some children you know who may have experienced these events mentioned. That’s because it’s a lot more common than people realize. A groundbreaking study by the CDC and Kaiser Permanente explored the incidence and impacts of traumatic events of individuals aged 0-18, categorizing them as adverse childhood experiences, or ACEs. It’s commonly referred to as the ACEs study. Their research revealed links between ACEs incidences and a person’s health and well-being. They found that the approximately half of the population had experienced at least 1 ACE, and 1 in 4 (25%) experienced at least 2 ACEs. This is across all socioeconomic backgrounds, and the original study was actually completed with upper-middle class subjects. 1 in 4 children! This is a huge problem. Statistically speaking, in a typical classroom of 28 students, about 14 of them have experienced one ACE and 7 have experienced at least two. Some of those children could have experienced even more! The ACEs study revealed that increased ACEs exposure led to increased risk of mental illness, like anxiety and depression, and developing chronic diseases like cancer. What are some potential effects of childhood trauma? The reason I say potential effects is that every child is a little different and still should be treated individually. To understand some potential impacts of trauma on a child, I repeatedly use this analogy about a gazelle and lion. Think of a gazelle in the grasslands constantly on guard for a hungry lion. The gazelle is always vigilant for the sake of survival, knowing a lion could be nearby and they may need to run at a moment’s notice. This is how a child is impacted after trauma. A child’s sympathetic nervous system goes into overdrive after a traumatic experience. This is what controls the fight, flight, or freeze response. That means they are always waiting for the lion. Their brains are wired for survival and are ready to react to a perceived threat at a moment’s notice. Let’s jump back to the analogy. What if the gazelle had multiple bad experiences with lions? Do you think the gazelle would react differently? Yes. It’s likely that the more lions that have chased the gazelle in the past, the greater the gazelle will be impacted with or without the lions around. This is the same with children and trauma. The more traumatic events that have occurred, the more a child will be impacted afterward. Makes sense, right? This repetition, also known as chronic trauma, has severe effects on a child. There are other potential effects of traumatic exposure in children as well. These can be broken into four functional categories: neurological/cognitive, social/emotional, sensory, and sense of self/control. Neurological/Cognitive: The exaggerated fight, flight, or freeze response I mentioned above is one potential deficit a child with trauma may face. A child may also have difficulties with attention, which could lead to memory issues or learning problems. They may also experience trouble with executive functioning (van der Kolk, 2003). Social/Emotional: Bessel van der Kolk, also known as the father of trauma, has said that the biggest impact of trauma on a child is their inability to self-regulate. This could also be stated as lack of emotional regulation. A child who has experienced trauma may also have increased anxiety, limited positive coping skills, and difficulties with social skills and overall communication (van der Kolk, 2003). Sensory: Children who have experienced trauma may have difficulties with sensory processing. They may be hypervigilant to touch or sounds, and may have difficulty with localization of sensation. These children may also have visual perceptual issues and overall sensory sensitivity (National Child Traumatic Stress Network, 2003). Sense of Self/Control: After a child has experienced a traumatic experience, especially if it was chronic, it’s possible they will feel they don’t know their identity (van der Kolk, 2003). This is known as lack of self-concept. They may have low self-esteem and have difficulty discerning appropriate boundaries (Child Traumatic Stress Network, 2003). What should I do as an occupational therapy practitioner? Let’s say you’re asked to assess a child in a classroom with a reported significant ACEs background. Just like every other diagnosis, you’re thinking of what you might see and what to look for. It’s possible that child won’t be able to pay attention in class. The child may also have difficulty managing their emotions, so may become upset easily if they feel unsafe or triggered. The child may also have difficulties with sensory processing. They may not trust people or know how to form meaningful relationships. They may feel unloved or unwanted and are engaging in attention-seeking behaviors in class. There are many things that could be happening. Don’t those all sound like things OT practitioners already work on with children? Social skills, sensory needs, emotional regulation? Absolutely! You treat whatever area of need the child has, regardless of the diagnosis. It is also important to incorporate “safety, predictability, and fun” into every therapeutic interaction, which allows the child to stay present to learn new skills and begin healing (AOTA, 2015 p.2). In addition to intensive individual intervention, an OT practitioner may provide primary and secondary promotion services. This includes services delivered in groups to a general youth population and a targeted group intervention for at-risk youth (AOTA, 2015). There are a few extra considerations for working with children who have experienced trauma that may be helpful to follow to get you started. To begin, you should consider your . . .
CARE (Communication, Actions, Relationship, and Environment) considerations. Here’s a breakdown below, but you can also find detailed descriptions of the CARE considerations on my blog. The first thing to consider when working with a child who experienced trauma is your communication, including verbal and nonverbal. For verbal communication, it’s important to use a pleasant tone of voice that is not too loud, not emotional, and not accusatory. You also want to give instructions with inviting language and suggestions instead of mandating phrases. This allows a child a sense of control. You may also encourage small wins in sessions. Focus on positivity and avoid negativity at all costs. For nonverbal communication, it’s mostly about your facial expressions: and they are key. You should do your best to feel calm, cool, and collected. Let that reflect on your face with a pleasant, neutral tone. Smiles may be welcome, but ensure it’s not forced and matches the child’s energy. As mentioned above, it’s likely the child will be more “on-edge” than other children without trauma exposure. It’s our job to connect with the child. We can do that by making ourselves as non-threatening as possible. This includes open body language and avoiding movements that are unpredictable in nature. It may also be helpful to move a little slower than usual to be recognized as safe and physically getting down to the child’s level. When working with this population, it is especially important to focus on a safe and positive therapeutic relationship. This can be done by encouraging the child involvement in OT with things that matter to them. For example, if they like trucks, incorporate them into the session. It’s also important to follow through on your promises, like a reward for doing something. You also want to prioritize building a foundation of trust and rapport along the way. Make sure the child feels comfortable in the environment. For some children, this could mean dim lighting. You could turn off the fluorescent lights in the room and use a smaller lamp or natural light from windows if you have access. This could also mean creating a comforting sensory corner or a place the child can go when they feel unsafe. It will be different for every child, but make sure you have options. It may also be important to have a plan in place for who the child will notify if they are feeling they need a break and what adult will go with them. What is important to take away from this? Remember that these children need you. They may not have had a strong or supportive adult figure in their lives up until now, and you may be the first one to care. You may be the first person to see past their behaviors to who they are as a people. There may be bumps along the road. They may not open up to you right away. It’s not personal and doesn’t reflect who the children are or who you are. Remind yourself that often and engage in self-care outside of work to stay at your best. You can do this! I’ve also shared a little about the research out there with childhood trauma. While there are a number of researchers in this field right now, there is limited OT involvement. We need more OTs to get involved and share evidence of what our treatments can do. This could open up doors for more OTs in mental health or trauma settings. It could lead to more program development or community-based centers. It would directly impact our profession to have more OT research. Overall, know that OTs can be the change-makers with this population! OTs can lead the way and educate teachers, parents, and other health professionals in the best way to interact with children who have experienced trauma. OT practitioners can also intervene through a primary or secondary health promotion approach, as well as intensive therapy with individuals following specialized training. OTs can use their own therapeutic skills to make a difference in these children’s lives. What’s mentioned today is not an all-encompassing list. It’s to help you understand what a child may be experiencing and give you a few suggestions to get you started. What treatments or considerations have you seen for children who have experienced trauma? What will you do to help current or future clients who are impacted by trauma? Let us know in the comments below! van der Kolk, B. A. (2003). The neurobiology of childhood trauma and abuse. Child Adolescent Psychiatric Clinics of North America, 12, 293–317.